A fresh and easy appetizer or light meal. Preheat grill or preheat oven to 400°. 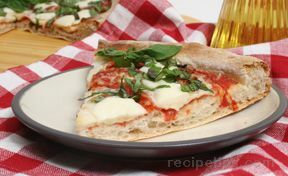 Spread sauce on prebaked pizza crust. Close cover of grill and grill for approximately 10 minutes, turning occasionally, or until sauce is hot and cheese is melted. Can also be cooked in a 400­° oven.